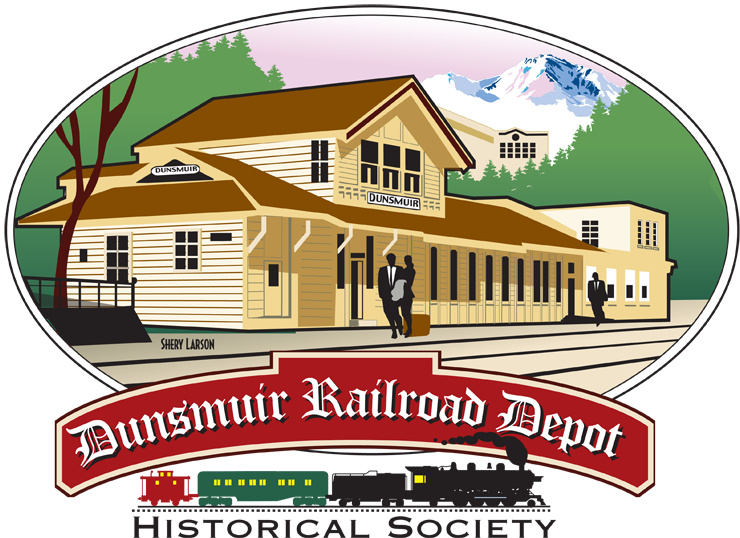 The Dunsmuir Railroad Depot Historical Society’s Dunsmuir Museum has closed for the winter months. The Museum will reopen April 1st, 2017. Visit us at www.dunsmuirdepot.com for the latest information. We were pleased to open the Museum the 1st and 3rd Saturdays and for town events this past year thanks to the following Depot members: Hank Billings, Hazel Billings, June & Neil Chichizola, Jan Connelly, Jerry Harmon, Gene Lachawicz, Billie Mathes, Stacy & Blake Michaelsen, Marie Nagle, John Signor, Carol Skalko, Phyllis Skalko, and Rick Somers. We are asking additional members to please sign up for next year. Email us any dates you can staff so that our museum can open. Folks enjoy revisiting Dunsmuir’s past and telling us their Dunsmuir history. May 28th – Our 8th Annual Pie Social during Dogwood Daze was another success thanks to 76 bakers who baked 55 kinds of pies for a total of 184 donated pies! Most pies were sold out by 1:30pm. And thanks to the Pie Social crew; you were awesome. June 10, 11 & 12 – RAILROAD DAYS – The Museum was open Friday afternoon, Saturdayand Sunday afternoon for the town event. The Museum displayed RAILROAD DAYS tee shirts from years past and RAILROAD DAYS buttons. June & July – Thanks to Pat O’Connor and her daughter, we had three Road Scholar groups visit the Museum (grandchildren and their grandparents from around the country). Of course pictures were taken during the Dunsmuir crew change! October 8 – Museum was open for the town’s Art Walk. October 15 & 22 – Our Pie Lady, Phyllis Skalko, held two successful Pie Camps/Classes at S.A.M. She and her helpers showed that making pie was…well, easy as pie! If there is enough interest, there could be a couple of Pie Camps scheduled before the Pie Social in 2017. Call Phyllis 530-235-0839 to let her know if you are interested in taking a Pie Making Class. October 15 – Lois Dewey drew the winning tickets for the Depot Society’s Ticket Drawing: Rhian Morris of Dunsmuir won the“CHERRIES” quilt and M. Van Cleve of New Mexico won the “TRAINS IN THE CANYON” quilt. Thanks to all who participated in the drawing! October 15th – Museum closed for the winter months…. Our Dunsmuir Museum brochure has been up-dated to include our 1st and 3rd open Saturdays; brochures have been placed around town. We are working on a 2017 display which will showcase Dunsmuir 1886-1986 pharmacies. The volunteers of the Shasta Division Archives have scanned, filed and indexed 2183 images, scanned 59 maps, and sorted by station name/type, filed and indexed 1002 drawings plus additional sorting and filing. They assisted in six in person inquires as well as email/phone inquiries. They can be reached at shastadivision@snowcrest.net. Regarding the Depot, as of early October the City of Dunsmuir took over the cleaning and maintenance of the Depot waiting room and restroom. To volunteer at the Dunsmuir Museum on a Saturday, 10 a.m. to 2 p.m. in 2017, please contact us with the date(s) you can staff the museum (see dates below). We need minimum of 2 people each day to open the Museum. Once again, we appreciate your continued support!